Normally, you know I post a little seed of legal information for you to grow your business. Today, instead, I’m alerting you to a special award program for Hispanic and Female Farmers. If you are a Hispanic or Female Farmer or you know of someone who qualifies, please feel free to contact me for legal assistance. I am currently only one of two attorneys listed to assist these farmers in Fort Worth. I am also available in my Dallas office for anyone who needs assistance. Hispanic or Female Farmers were the subject of a proposed class action for discrimination, resulting in a claims process. Depending on the farmer’s eligible Tier, a farmer who files a complete and timely claim may be awarded up to $50,000 in Tier I(a) or $250,000 maximum for Tier I(b) or $50,000 for Tier II. The farmer may also be eligible for debt and tax relief. Who should consider filing a claim? Farmers who believe that the USDA improperly denied them Farm Loan Program benefits between 1981 and 1996 and/or between mid-October 1998 and mid-October 2000 because they are Hispanic or female may be eligible to file a claim under this program. The farmer believes USDA actions were based on the farmer being Hispanic or female. Remember claims must be filed no later than March 25, 2013 May 1, 2013 to be eligible. 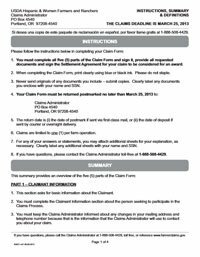 Click here to download the claim form (which an eligible farmer may fill out with or without assistance). Want to know more? Feel free to contact Dodge Legal Group, PC. We are here to serve you.